Welcome to day seven of my summary of my experiences on Marco Borges’ 22-Day Revolution. To find out why I started this vegan diet challenge, and to begin with day zero, click here! Please note that these recipes are for day four of the plan as I had to wait until today to get my tapioca flour! 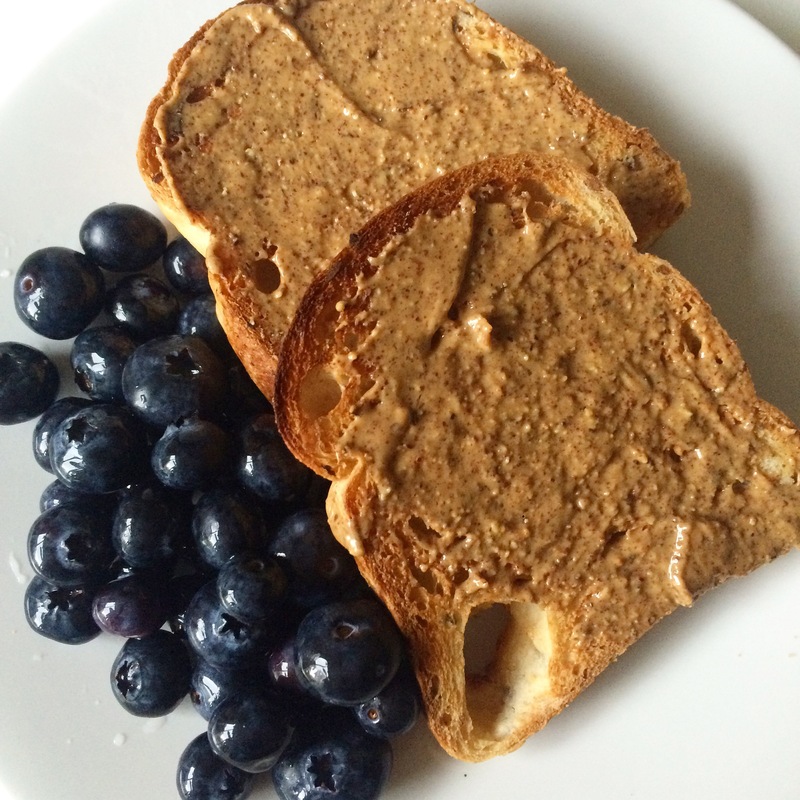 Day four should begin with some chia pudding, but I enjoyed yesterday’s almond spread on toast so much I had it again today! 298 calories, served with the blueberries, but not the banana. Then it was time for the much anticipated vegan pizza. One of the main selling points of this diet seems to be “and you can even eat pizza, too!”. Well… after a fashion. 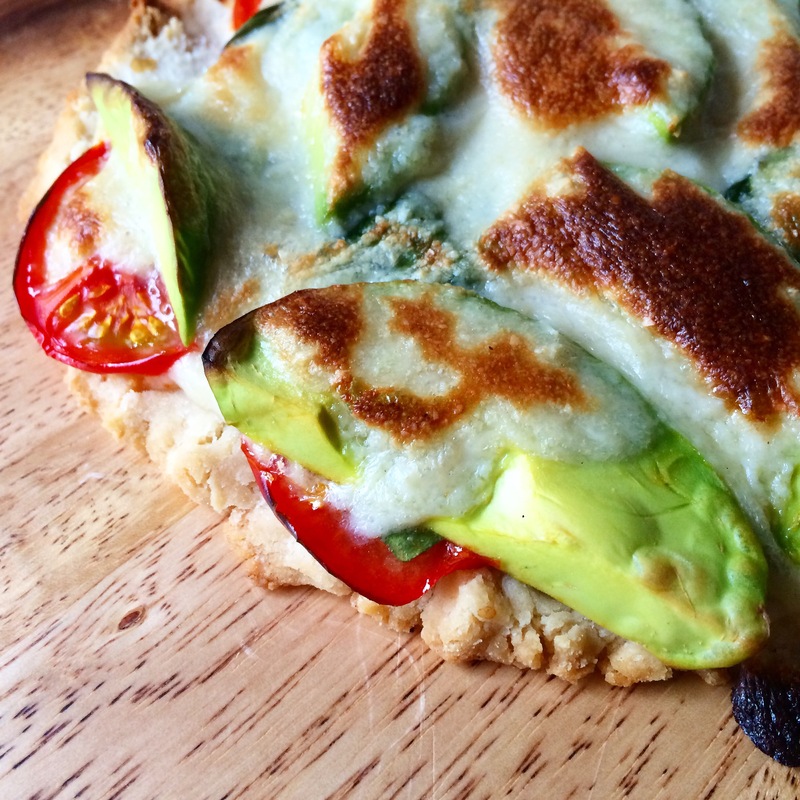 You make a crust of brown rice flour and tapioca flour, which feels more like Play-Dough than pizza dough, and then shape it onto your baking tray, pre-bake (or, pre-harden maybe…), then load it with tomato slices, avocado slices and vegan cheese, which is made by blending soaked raw cashews with water, tapioca flour, cider vinegar and lemon juice, and then cooking until it thickens. I wondered if the recipe called for too much water, because I had to cook off a lot of it before the cheese thickened. And, because my blender isn’t really top-notch, there were still grainy cashew pieces in it. I strained those out and ended up with some thickish, smooth cheesy-looking stuff, and there was a lot more than I needed even for two servings. So, what was my verdict? Well, I said I’d be honest! Although it wasn’t really good, it also wasn’t that terrible either. I didn’t like the cheese all that much but I’m still up for trying vegan cheese rather than the cashew cheese from this recipe. However, the vinegar and lemon juice in it did give it a taste that reminded me of Welsh Rarebit, so that was pretty nice. 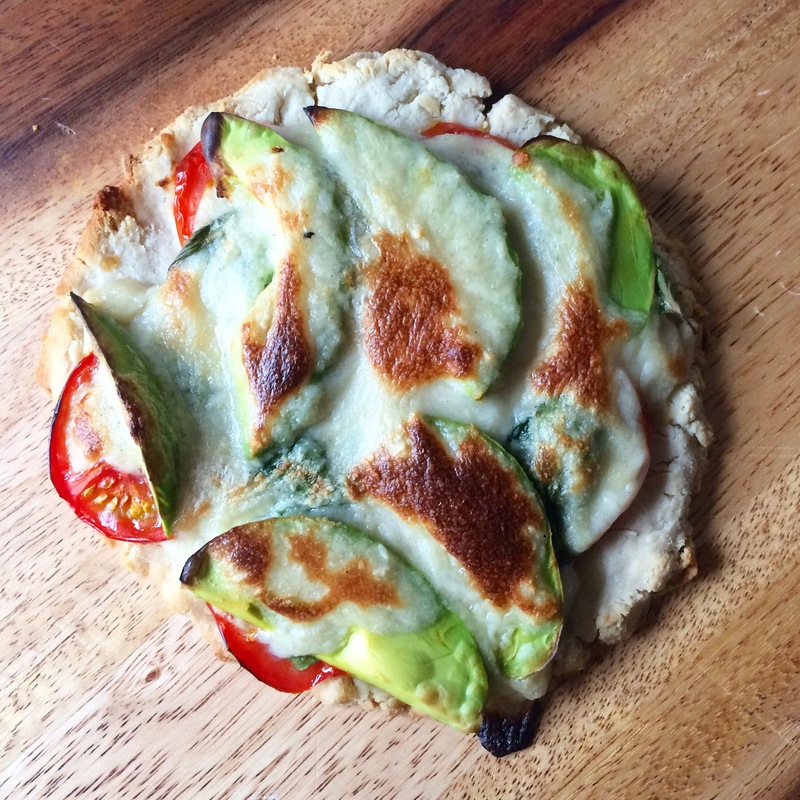 The pizza base wasn’t brilliant, to be honest – I refuse to believe this is the best gluten-free pizza base you can make. It was pretty hard and crunchy – I’d recommend you use a rolling pin to shape it, rather than your fingers as is recommended. If you get it thin enough, the crunchiness might be a bit more palatable! Calories here wound up as 581. I was excited about dinner as I got to try out my new spiralizer, which was kindly sent to me by www.ukjuicers.com. 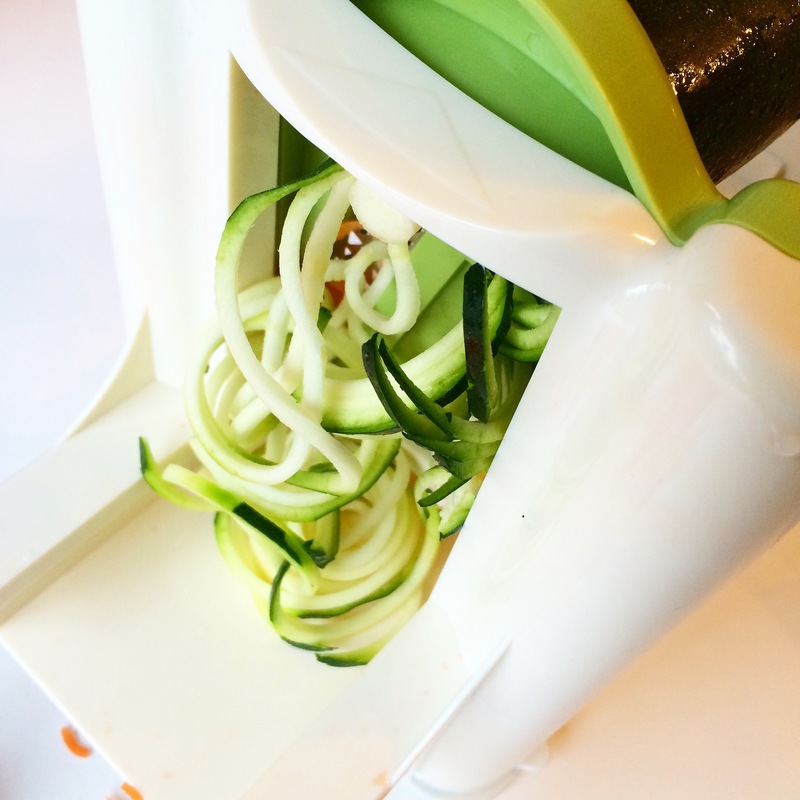 It’s a Lurch Spiralizer, and it is absolutely adorable – it reminds me of a Fisher-Price toy! It has three detachable blades, and you can store two of them handily as little drawers in the side. It’s currently retailing for £25.59, but is out of stock at the moment here. However, you can see the full range of spiralizers here – they have other versions of the same spiralizer (just with different colours), and a very fancy Benriner one, which is also used by Yo! Sushi! 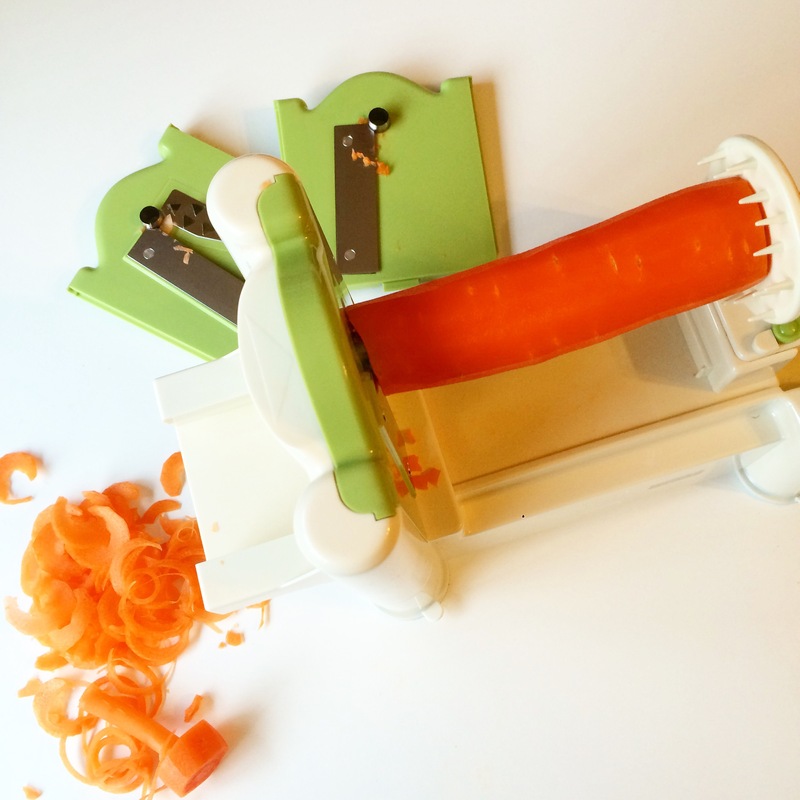 I can definitely vouch for this model (same one as this, currently in stock at www.ukjuicers.com) – it’s so easy to use, you just need to put a bit of pressure on the end of the veggies you’re cutting to push them through the blades as you turn the handle. 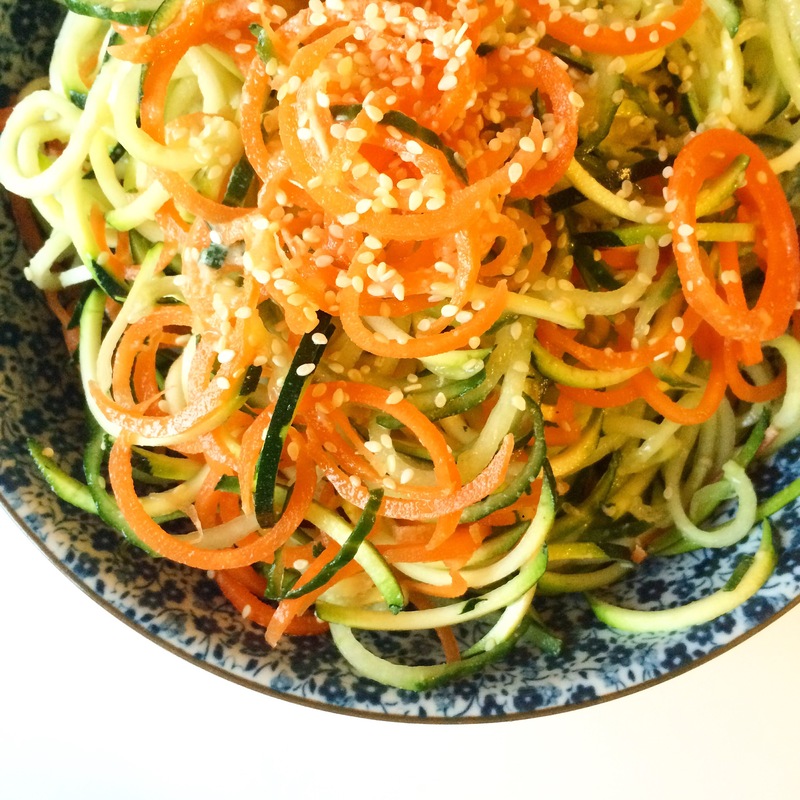 With summer coming up, they’re a great way to make colourful and interesting side salads for parties and BBQs, and also, for making those famous courgette noodles for the 5:2 diet! 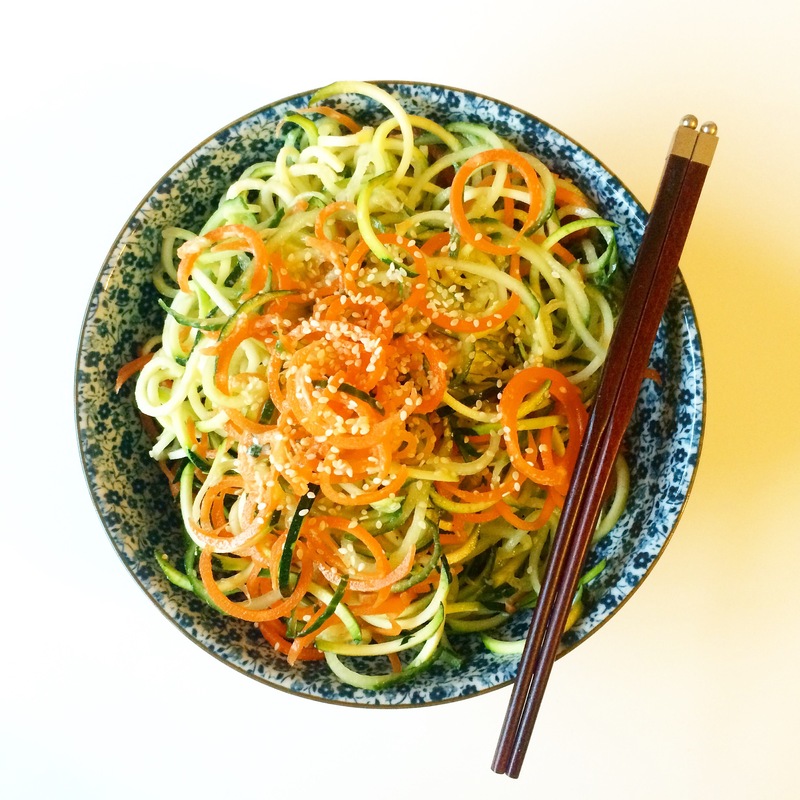 With my courgette, carrot and cucumber salad spiralized, I made up the dressing of tahini and lemon juice, then poured it over together with some sesame seeds. To be honest, I think there was way too much lemon juice in this dressing – it pooled like water on the bottom of the bowl and barely stuck to the salad at all. Never mind, I definitely saved on the calories from the tahini, because I must have only eaten half of the full tablespoon I added! Calories were 282. Full calories for the day were 1318, because I also ate a Sharon fruit and my usual cup of rice milk. I did go on my exercise bike for 45 minutes too! I started this diet yesterday and since I’m forcing my husband on it too, I decided to move the menu around. I looked at the lunches and moved the time intensive or lunches I thought would be better if eaten fresh for when he’s home on the weekend. I just made the pizza myself and wasn’t the crust just awful? I made my crust very thin and it was more like a cracker, maybe that was the problem. Not tasty at all. I did however like the cashew cheese. I’ve been vegan for around 7 years and maybe I’ve just gotten used to the odd cheese substitutes. But there is no way I would consider this a pizza! In the U.S. How have you been feeling on this diet? I am trying to decide if I’m coming down with the flu, suffering caffeine withdrawal or if I may be having low blood sugars. I’ve been feeling run down and actually had some hot and cold spells this weekend. I’ve been vegan for a while so it shouldn’t be associated with meat withdrawal. I broke last night and had some seitan with the eggplant and pico (which was delicious!) and today I felt much better. A little bloated, but better. And I had a cup of coffee this morning. I haven’t had the energy to do anything more than an evening walk as far as working out. And I’ve lost 2 and half pounds. I started this diet off when I was coming off from having a cold, and have been generally feeling run-down and tired for most of the time, with no real reason why. I can’t say that the plan has affected my energy levels one way or another – I don’t feel better, but I don’t feel worse either! I have to confess I haven’t cut out caffeine at all – my tea is the only vice I refuse to give up! I’ve made more of an effort over the last few days to make sure I’m exercising as well, but I haven’t really felt all that up to it – just forcing myself through the motions. Today is my day 11 and as of today I’ve lost 9lbs. It’s utterly incredible! Congrats on your weight loss – if I used to lose two pounds in one week I thought I was on fire, this is pretty much unprecedented for me (except for my self-imposed boot-camp I did a couple of years ago for Ascot!). Greetings from Rockford, Illinois! Thank you so much for your daily account of the diet! My boyfriend and I are currently on Day 7 and loving it. We’ve skipped the pizza and the sushi…as its just too labor intensive and I doubled some of the recipes so I could cut down on purchasing all of the ingredients. He’s down 12 lbs in 7 days and I’m down 6! It works! Hey Katie – so glad you’re enjoying the coverage and doing really well on the plan! Doubling down on some of the meals sounds like a great idea – and it must be working if you’re seeing such great results! Amazing!